Image Size: 38"w x 24"h.
Say the word “gunfight” and images of dusty streets, cold steel and haggard men with narrowed, unblinking eyes beneath wide brimmed hats, fill the mind. And no stand-off worth its weight in celluloid could occur without an over-scored and warmly lit “Heroes’ Walk” to set the tone for the reckoning to come. Blessing’s Looking for Trouble is the next installment in his ever-expanding vision of the Neon West. 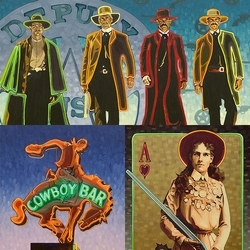 With Neon Gunslingers, Michael Blessing introduced a contemporary/pop vision of the iconic Western, painted with the color and radiance of neon gas. Here, Blessing revitalizes the image of the Earps’ and Doc Holliday’s legendary walk across Tombstone in the days when reputations were made for those known to be dangerous with a gun.